This past Saturday was the big City of Craft show. This was the second year for this wonderfully ambitious, independent show. I was lucky to be able to take part in a small way by doing a one hour free workshop on making a set of fabric-covered magnets. I had planned to arrive early so that I could browse around and chat with everyone and buy myself a couple treats. Of course, Saturday arrived and I wasn’t completely prepared and ended up showing up at the venue as a crowd of people eagerly awaited my workshop to begin. From my second floor vantage point I could see how lively the show was down below. Above you’ll see Becky & I racing to photograph one another. The entire day felt like a race to me. My one hour workshop went by in what felt like fifteen minutes! When my hour was up, I allowed myself five minutes to rush around the main floor to see everyone’s displays. It certainly wasn’t enough time to fully appreciate all the lovely things, nor to properly shop. If you saw me at the show and I rushed by you like a crazy woman, I’m sorry! I had to hop back in a cab and hurry back to the workroom for a class I was teaching there. Congratulations City of Craft! You gals did an incredible job and deserve lots of good rest! The holiday rush of classes is just about done, so I’ve finally been able to start up on my own last minute holiday gift production. Nine days to go! Am I the only one that is WAY behind? ‘In face? !’…I did mean to say ‘in fact’. When I can’t write a simple sentence it is no wonder there are half made books, bags and snap coin purses all over my work table. 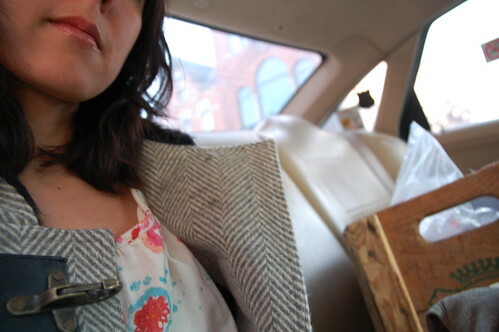 karyn — that is a great photo of you in the back of the cab, but where is Chuck Bass and the champagne? my 100 % workroom-inspired xmas gifts are close to being done. Only 2 bucket hats left to go!!! I have finished all my family gifts and mailed them yesterday! Now I have to finish some friend gifts and I’ll probably be in to use the laser to cut some ornaments for my co-worker gifts. It never ends! At least it’s fun. Karyn – what a trooper you were on Saturday! You really were racing around, I hope you had a relaxing evening after closing up shop. as for my holiday gifting, i get to hide under the excuse of being jewish. it’s not much of an excuse, though, as my greater family is so mixed that i really should be making gifts. jill – if chuck bass had been in that cab, i likely wouldn’t have made it back to the shop for my class, likely we would’ve snuck off to new york city for a french bistro dinner! i’m impressed beyond words at your holiday production! your friends and family are going to be delighted. michelle – i’m still trying my hardest to make as much as possible… until next tuesday when i’ll really have to assess how realistic it is. i was happy to see you on saturday and totally thrilled that so many people stopped by to make magnets with me. next year i will clear my schedule, so i can enjoy more of the show. angelune – good for you! i look forward to seeing what ornament design you come up with this year! i can’t even recall what i did saturday night, likely i was quite comatose, in a over-crafted way. becky – you deserve all kinds of accolades for such a grand event. enjoy a momentary rest from the world before we start planning our valentines fest. nope you’re not the only one! so far i have only finished one snap coin purse. one. blargh. i’m sure you’ve made more progress!